Maxeler Makes Waves With Dataflow Design – Digits – WSJ – Carpet Bomberz Inc. Thanks. I used to participate in a discussion board on the old Byte.com website about micro-processors and CPUs. And I was always fascinated by the idea of being able to reprogram the logic on a processor while doing calculations with it. Occasionally you’ll see Wired.com do an article on ‘evolutionary computing’ where the chip gets modified as an analysis/simulation is running. But it’s all been experiments for the most part. The only other activity I’ve seen is AMD pairing up FPGAs alongside their cpus in Scientific super computers for the National Weapons Labs. So there’s a small community still trying to get things going. On the desktop though I think there’s more possibilities, and I say this as the ‘intelligent TV’ market is starting to take shape. 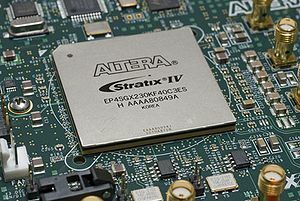 With a full-on FPGA sitting on a motherboard with a general purpose CPU, there’s no telling what you could do with an intelligent TV for that matter. My Sony TV can now get updates on the fly and it’s got nothing more than a set-top style MIPS chip inside. Pair it up with FPGA as a co-processor and you’ve got a full computer that could do LOTS of different things. Pingback: FPGAs: The software in the hardware « Carpet Bomberz Inc.